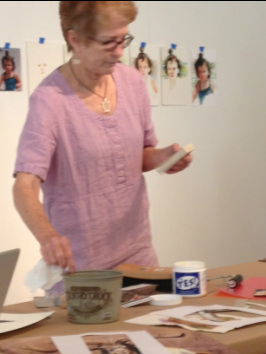 The last workshop with Jane was a huge success! Limited enrollment in all classes. Be sure to register early to insure a place in this workshop. "The Best of Watercolor" October, 2010. Master portrait painter Jane Angelhart will share with students a rare opportunity to learn professional secrets for letting colors and faces bloom from the page. Students will benefit from Jane's instruction about how to paint a portrait with multiple luminous layers, without dissolving previous layers or muddying the color. The workshop progresses with many helpful tips and strategies for simplifying the portrait painting process. Students will also learn about how to enlarge reference material on a computer screen for greater understanding, information and improved painting, and how to let the vibrant transparent colors grow and bloom in unexpected directions. To facilitate full understanding of the watercolor painting concepts discussed, students of all levels will benefit from her calm comforting style, easy to follow instruction, and encouraging advice. If you've been reluctant to really put the vibrancy of watercolors to the test, this is the workshop for you.